Winter has arrived in Summit County. We have been getting feet on feet of snow! I am struggling to keep my plants alive in my little apartment. As for my eating habits, I am in winter-mode full swing. There have been a lot of potatoes and winter squash in my life. In the spirit of Thanksgiving, I wanted to share a delicious Turkey recipe with all of you. I have been eating turkey quite a bit for the last few weeks, but somehow am still not sick of it! I have been playing around with my new SousVide Supreme also and have some delicious creations to share with you over the next few weeks. This recipe is the perfect combination of savory, sweet and floral. No single flavor overpower the other. 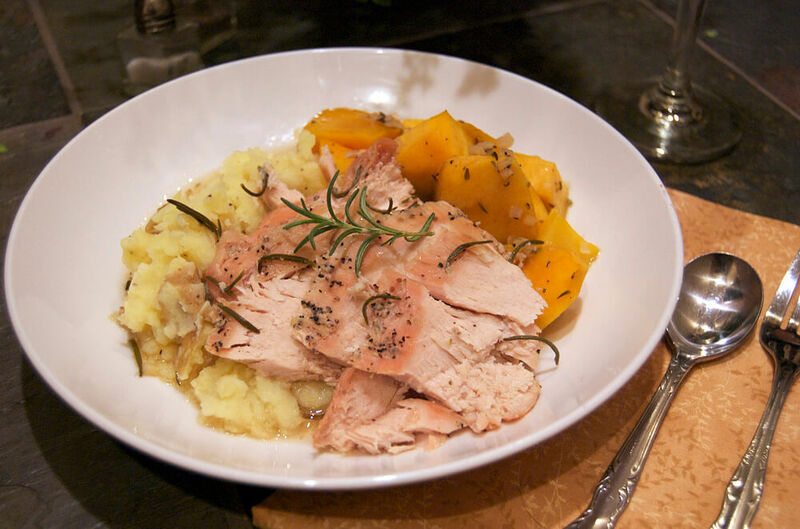 If you are cooking a Thanksgiving for your family, try just buying the breasts instead of a whole turkey; it will cost less and you can make this delicious recipe! If you don’t have a Sous-Vide machine, you can baste the turkey with maple syrup and butter until it is cooked through. The floral aroma of the rosemary, infused withe the rich, sweet maple syrup, is a match made in heaven! Heat the water bath to 165F. 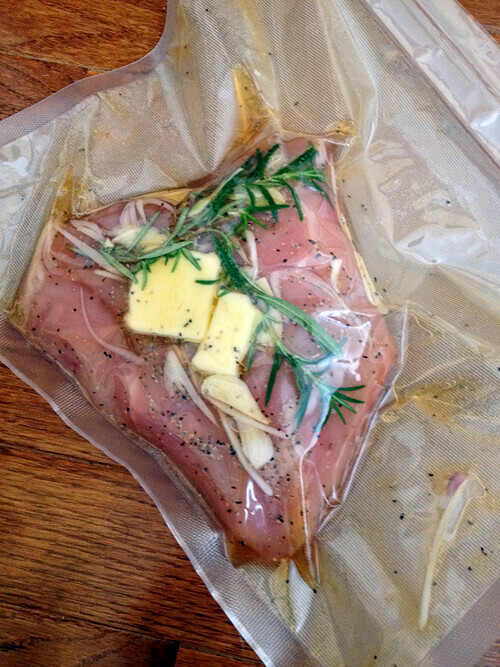 Vacuum seal all ingredients in bag. Place the bag in the water bath until the core of the turkey reaches at least 165F, about 2 hours. Slice turkey and serve over mashed potatoes, drizzle with cooking liquid.